A massive, draw dropping collection. A massive, draw dropping collection of 1800 unique Loops which tip the scales at just over 1.2GB before file conversions, and which includes over 1265 Breaks, Beats and Rhythms, along with 535 Music and Sound Loops suitable for interpreting into a huge range of styles and suitable for all modern music makers looking for something a little non-specific to inspire. 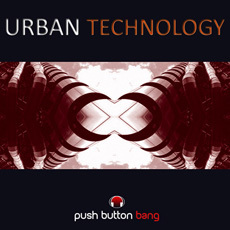 The Urban Technology sample pack from Push Button Bang includes no less than 144 fills and builds, 171 Electro noise beats, 186 Fast Tempo Breaks, 63 Metallic Breaks, 145 Mid Tempo Breaks, 318 Punked Up Beats, 112 Slower Breaks, and 126 Leftfield Beats. The Musical side to the collection covers more than 37 Ambient one shot samples, 22 Atmospheric Loops, 135 Sequenced Arpeggios, 70 Synthetic Loops, 66 Leftfield Sound loops, 45 fast tempo musical parts, 13 Delay FX Loops, 61 Pre Ducked Loops, and 86 Straight Synth Loops. Its not suprising that with so much content available and all created especially for this project - that you have a wealth of material to choose from which can provide an infinite range of possibilities for creative producers looking for something a little different than a straight genre or artist collection.